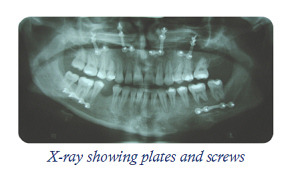 Orthognathic surgery is jaw surgery that is undertaken to reposition the upper and/or lower jaws. This form of treatment is commonly undertaken in patients who are unhappy with their facial appearance and/or where there are functional problems with the bite. Jaw correction surgery is often planned jointly by an orthodontist and an Oral and Maxillofacial surgeon. The surgeon is responsible for repositioning the jaws and the orthodontist is responsible for ensuring that the bite is corrected. It is vital that the orthodontist and surgeon work very closely together in order to ensure the success of treatment. Close communication is an important key for success. When a jaw size discrepancy (mismatch between the upper and lower jaw) exists, the teeth are often in a position that attempts to compensate for the abnormal relationship. For example, if the lower jaw is short, the lower incisor teeth will be leaning forwards greater than normal (proclination) in an attempt to meet the upper incisor teeth. When the lower jaw is protrusive, the upper incisors will often be leaning forwards and the lowers backwards (retroclination) in order to normalise the bite. This is termed dental compensation. If the jaw position is to be corrected, orthodontic treatment will have to be undertaken before surgery in order to decompensate tooth positions. Only if this is undertaken will the teeth fit together properly following surgery. Pre–surgical orthodontic treatment can often make the bite appear worse before surgery as the dental compensations are removed. Genioplasty which is used to reposition the chin point alone. Orthognathic surgery is undertaken under general anaesthesia and may involve an overnight stay in hospital following the procedure. As all treatment is undertaken through the mouth, no external scars are left following treatment. The jaws are artificially fractured and repositioned, with the help of a wafer that is constructed before surgery, and secured into position using titanium plates held in place with small screws. The bones typically take 6 weeks to heal when the plates have served their function. Following surgery one can expect facial swelling which takes approximately six months to resolve fully. The majority of the swelling has often reduced after approximately 2–3 months. Most people often require 2–3 weeks off from work for good recovery. Lower lip numbness. This can occur following lower jaw surgery. The risk of permanent lip numbness is 5–10%. The risk increases in older patients and can be up to 50% in those >40 years. If numbness occurs it does not affect the movement of the lower lip. Plate infection. Plates become infected in about 10 % of cases. Plates used to stabilise the lower jaw become infected more commonly than those used to stabilise the upper jaw. If an infection occurs, the plates will have to be removed. It is usually safe to remove plates > 6 weeks following surgery as they should have fulfilled their function by this point. Relapse. There is always a small chance that the bite will change following surgery. Some forms of surgery are more prone to this complication and the surgeon will talk to you about this if this is the case. Following surgery it is often necessary to undergo a 6 month period of further orthodontic treatment in order to detail the bite. This will often involve wearing elastics between the upper and lower teeth to settle the bite. Following orthodontic treatment it will be necessary to wear retainers in order to maintain the corrected tooth positions.